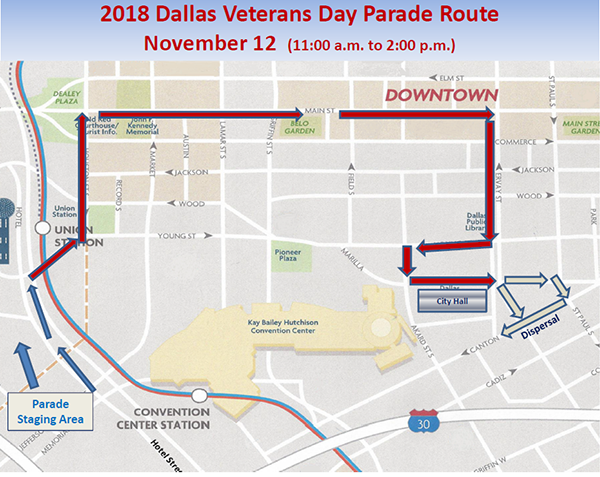 The City of Dallas is warning about road closures in downtown Monday during the annual Greater Dallas Veterans Day Parade. Some roads will close to vehicle traffic as early as 8 a.m. while others will close shortly before the 11:15 a.m. start time. 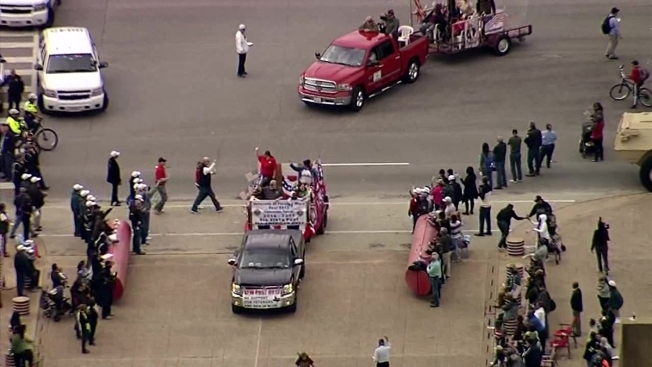 Dallas' annual Veterans Day Parade will begin at about 11:15 a.m. Monday in downtown Dallas. The parade begins at the corner of Houston and Young Streets and travels north on Houston before heading east on Main Street. The parade will turn south on Ervay Street, then west on Young Street, and finally south on Akard Street before ending at City Hall Plaza. City officials said about 20,000 people attend the parade each year. A route map appears at the top of this article -- road closures are listed below. Parade route streets will be closed to traffic from 11 a.m. - 2 p.m.
Akard Street – From Young Street to Marilla St.
DART said a number of bus routes on detour beginning at approximately 11 a.m. and continuing through the duration of the parade including: 2, 11, 12, 19, 21, 26, 29, 35, 42, 52, 59, 60, 63, 76, 81/82, 110, 111, 161, 164, 206, 283, D-Link (722) and 749 Stemmons-Design District Service. See the DART rider alert here.